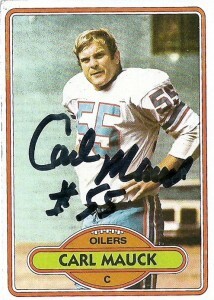 In the Jurassic Era of AFL football, even before offensive linemen Mike Munchak and Bruce Matthews roamed the gridiron for the Houston Oilers, perhaps one of the most solid technicians to play OL for the team was Center Carl Mauck. Originally drafted by the Baltimore Colts way back in 1969 in the 13th round of the NFL draft, Carl bounced around his first 3 years in the league. After only 4 games under his belt in 1969, Carl moved to the Dolphins for a season for another 3 games experience. 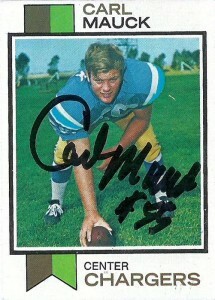 It’d be in his time in San Diego in ’71 he’d finally position himself as an outstanding lineman, leading the Chargers from center for the next 4 seasons. The Oilers signed him in 1975. With a new head coach in Bum Philips, the team was trying to change its losing ways and signing Mauck was a way of stopping the revolving door on the offensive line. The 6-4, 243lb, offensive lineman had 55 games under his belt, and immediately became a guiding force in young quarterback Dan Pastorini‘s football life. Mauck was also a road grader, providing great inline blocking for Earl Campbell. In 1978 the offense set an NFL record with the least sacks allowed on the season with 17. He’d also succeed in stabilizing the line woes starting 94 games over the next seven seasons, retiring after the ’81 season. Carl went straight into coaching, following Bum to New Orleans. Considered a virtuoso at coaching offensive line blocking, Carl spent the 1982 through the 1985 seasons with the Saints, before coaching with the Chiefs, Buccaneers, Chargers, Cardinals, Bills, and Lions. In his first coaching stint with the Chargers, Carl was reunited with Bum Philips’ son, Wade, where the team appeared in Super Bowl XXIX following the 1994 season. From 2006-2007 he coached tight ends at his Alma Mater, Southern Illinois. Carl is an active NFL alumni and frequently gives his feedback on the state of the NFL, players and coaches. He also appeared at Fan Fest II in Houston. Currently he lives outside of Dallas, Tx.